Post by Professor Heather Viles, School of Geography, University of Oxford, UK. Observations in arid and hyper-arid environments on Earth show a range of processes, often acting together or in sequence, which cause rock breakdown. These processes cut across the conventional categorisation into weathering and erosion and illustrate the synergistic associations of chemical, biological and physical weathering and aeolian abrasion. Whilst there is no exact correlation between the processes at work and the features formed, because of geomorphological equifinality and complexity, nevertheless the appearance of breakdown features is a visual signature of the processes at work. 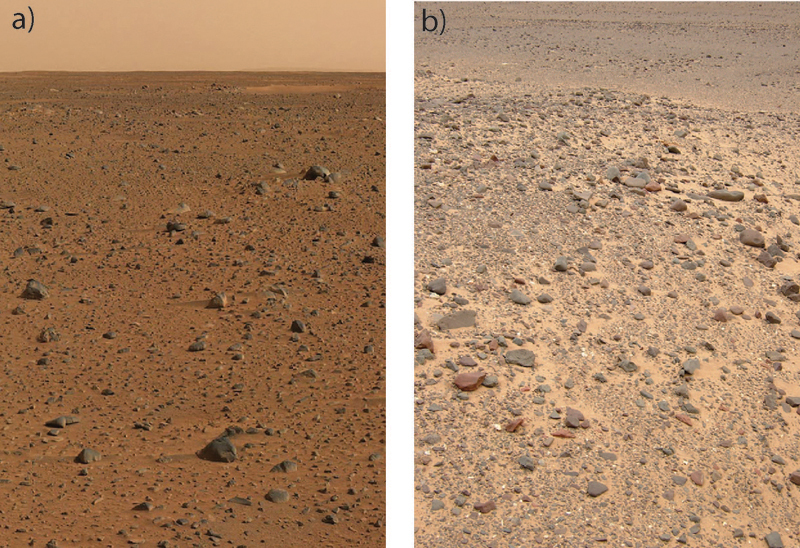 The similarity of breakdown features on Martian surfaces with those found in arid and hyper-arid environments has been noted ever since the Viking mission brought back close-up images from Mars. However, the more recent perambulations of the Spirit and Opportunity rover vehicles has brought into sharp focus the clear similarities between surface rock breakdown on Mars and Earth. The image pairs below illustrate these similarities, not only in terms of the shape of the rock clasts, but also the geomorphic environments in which they are found (Images 1 and 2). Image 3: Resistant bedrock ribs protrude from the landscape. a) Mars. b) Skeleton Coast, Namibia. What are the major processes thought to be at work on Earth causing such rock breakdown? In arid and hyper-arid environments salt weathering, thermal cycling, microbiological and lichen weathering and wind abrasion have all been hypothesized to be important. One key observation is that rock breakdown process interactions vary hugely as a function of micro-environmental conditions within arid environments (Viles and Goudie, 2007). Thus, aspect and boulder surface geometry are both key controls of microclimate and thus the dominant mode of rock breakdown. The parts of boulders that are in contact with sediments break down in a different way to those only in contact with the atmosphere. Image 4: Angular, sub-angular and tabular-shaped rocks. a) Pathfinder Site, Mars. b) Messak Settafet, Libyan Sahara Desert. Image 5: Distinctive rock breakdown features suggest the role of water. a) Sprit Rover, Sol 810. b) Skeleton Coast, Namibia. On Mars, lack of water under current conditions will limit the range of active rock breakdown processes at work, but over the distant past a wide range of processes (similar to those operating in Earth deserts) are likely to have occurred. Their imprint may still be visible today, as evidence now suggests that surface features produced by some breakdown processes are highly persistent in the face of subsequent weathering and erosion (Rodriguez-Navarro, 1998; Ehlmann et al., 2008) (Image 3, 4 and 5). Experimental studies, carried out under near Martian conditions, also imply that the current environmental conditions on Mars may be more able to produce breakdown through thermal cycling than previously thought (Viles et al., 2010). When clasts which have been subjected to long breakdown histories experience the diurnal cycling found today on the Mars surface, the experimental evidence suggests that they can crack and break down into finer grained sediment. The challenge now is to link the visible signs of rock breakdown evident on Mars (from lander and rover imagery) and in deserts on Earth (from field exploration) convincingly to past and present process regimes (e.g. Chan et al., 2008). Chan, M, Yonkee, WA, Netoff, DI, Seiler, WM, Ford, RL. (2008) Polygonal cracks in bedrock on Earth and Mars: Implications for weathering. Icarus 194, 65-71. Ehlmann, BE, Viles, HA, Bourke, MC (2008) Quantitative morphologic analysis of boulder shape and surface texture to infer environmental history: A case study of rock breakdown at the Ephrata fan, Channeled Scabland, Washington. Journal of Geophysical Research 113, F02012, doi:10.1029/2007JF000872. Viles, HA, Goudie, AS (2007) Rapid salt weathering in the coastal Namib Desert: Implications for landscape development, Geomorphology 85, 49-62. Viles, HA, Ehlmann, BE, Wilson, CF, Page, M, Bourke, MC (2010) Simulating weathering of basalt on Mars and Earth by thermal cycling. Geophysical Research Letters 37, L18201, doi:10.1029/2010GL043522, 2010.